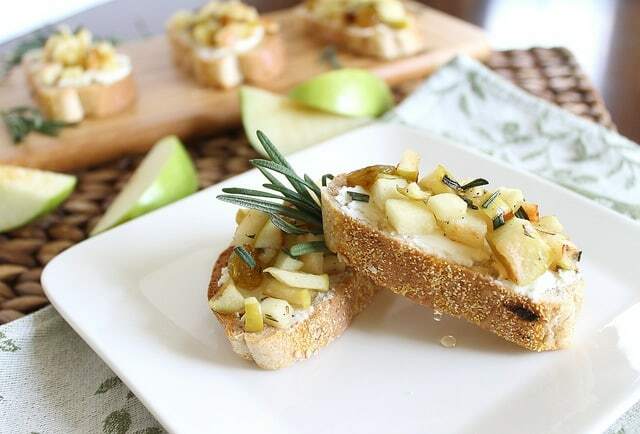 This apple and goat cheese crostini with rosemary is savory, tart and sweet all wrapped up in one bite. Are you throwing a party soon? No? Don’t worry, neither am I. In fact, I think I’ve had people over our house outside of a holiday a total of 2 times in the past 3 years we’ve lived there. Super lame. Here’s the thing about these, while they’d rock your guests’ faces off, they also make for a really good “I just want to eat a fancy finger food” kind of appetizer for a wild weeknight by yourself. You know you have those nights. They also work as a great 4pm snack while you’re stuck on a conference call that spends 1 of the 2 hours trying to get everyone logged into a new software system. Logged in. Not even using it, just logging in. Instead of losing my cool at the incompetence, I made crostini while on speaker phone. I call that progress on the whole patience thing. I know spring doesn’t exactly scream rosemary. You’re probably wanting to shove basil in your face and all of those other fresh springy herbs you’ve been deprived of the last 5 or so months and not really thinking of rosemary. Indulge me with this though. Seriously, it’s worth it. Sautéed apples + rosemary just smacks you in the face with amazingness from the smell and taste. The combined flavors are savory, tart and sweet all wrapped up in one perfect bite. Hour 2 of the call was spent learning how to use the software and simultaneously eating half a baguette’s worth of crostini. There are two reasons the mute button is my best friend when working from home, a dog that goes ballistic at the first sound of a delivery man coming up the driveway and my inability to get through any sort of conference call without needing to stuff my face full of food. This was definitely one of the more tasty conference call creations. Saute apples, raisins, rosemary, salt & pepper with olive oil over medium heat until softened and raisins begin to plump up. Add 1 tablespoon of water while cooking if mixture gets too dry (this will also help raisins plump). In the meantime, toast the baguette slices until just starting to turn golden brown around edges. Spread goat cheese on baguette slices once toasted. Spoon sauteed apple mixture on top of baguettes. Drizzle with honey and finish with more chopped rosemary for garnish. hello, gorgeous. i love the pictures in this post. 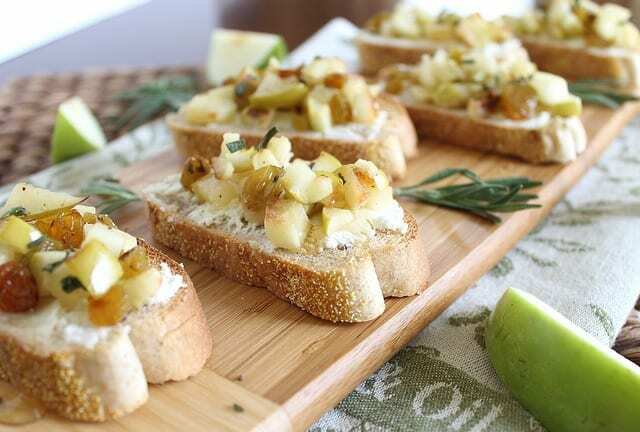 this entire post actually reminds me so much of SPRING and apple picking…and then using those apples to make these goat cheese crostinis..amazing! i would probably throw a party to celebrate…spring….and then make these so i can eat them :) haha what a great excuse! Yum! I love apples and cheese together so good! I love all the flavors you have here. very creative! This would make a wonderful quick side dish with dinner!!! Can’t wait to try it!! Yum! I just pinned this so I can remember to make these for girls night coming up in a few weeks. These look so yummy!! Gina, I think you purposely post delicious recipes this early in the morning because you find it amusing I drool all over my keyboard bahaha. But seriously, I LOVE this combo of goat cheese and apples. So taking it one step further with rosemary is just genius. I do love basil when warm weather hits, but there’s just something earthy and delicious about rosemary that basil can’t fix! Thanks for sharing! 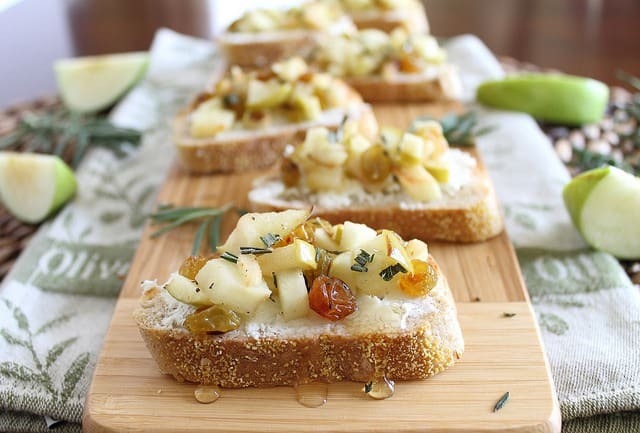 I have made apple, sage, fontina crostini… Never would’ve thought of mixing apple and rosemary together, but will definitely give this a try. Gina your pictures are too gorgeous for words. Can I take lessons from you? I can’t even tell you how many times I’ve done that. There’s no good way to explain that one either. Honestly… I would NOT be able to stop eating those! I love rosemary all times of year. Ooooh, the honey dripping down in that first pic….YUM. Looks like the perfect party food (or anytime food :-)). Instead of losing my cool at the incompetence <—- Girl that seems to be a theme in LIFE. There are times I wonder how the world gets anything DONE when I see some of the incompetence day in, day out. But deep breaths, right! And the light, the gorgeousness of these photos…If you tell me you did these one-handed or while on speak phone, I'll die. Because they are stunning! mmm rosemary, apple, goat cheese… favorite combos! Missing fall flavors right now quite a bit but basil mozz and tomato isn’t so bad either. You are ALWAYS making me hungry! ;) Pinned. I’ve seriously been loving all your recipes lately. Please come over and cook for me. I’ll throw a party and then we can both be cool and have a social event planned! I wish I had been on your side of that conference call. It’s rough not banging your head against the wall when there are directors in the room. You only ate half of the baguette? I’d have eaten the entire thing, and the entire log of goat cheese, during that one call. These are callin’ my name, so yummy! MMmmmm. These remind of a small plate I ate the other day at a restaurant here in town. I love goat cheese on crusty bread! Crostinis are showing up everywhere right now – is it a spring thing??? I WANT SOME! I love the goat cheese with jam, so I’m guessing this must taste like heaven. These sounds so good! I made a chicken sausage stuffing this winter that used apples and rosemary. It was really good, and I still crave those flavors… but who wants stuffing in 80 degree weather? This is such a great way to still enjoy that sweet-savory apple-herb combo in the spring. On my to-make list! Love goat cheese! And they say we can’t multi-task! I can’t decided if I want to make this an excuse to have people over, or just an excuse to open a new bottle of wine with the husband tomorrow night :) I love it! Sign me up for anything goat cheese!